I wanted to replace the hardware on my aluminess rear tire carrier as the upper strap was bent by previous owner and I had play in the lower most Pivot bolt which sits just above the stock bumper. This bolt was seized and I had to cut the nylon lock nut off. Unfortunately I can't tap the shoulder bolt out due to clearance with the bumper and need to remove the carrier completely. I have a non-step bumper with only two mounting bolts to which the aluminess carrier mounts. These bolts were rusted as well. There is a weird hard plastic/rubber cap over the head of the bolts facing rearwards towards the bumper. Because of this, you can't feel or access the head of the bolts to get a wrench on them. Soaked bolts in PB blaster for 5 days and stills stuck. I contacted aluminess and they said that this piece (rubber/plastic cap) is not necessary. I hope so I appear to have broken it trying to remove the two mounting bolts. 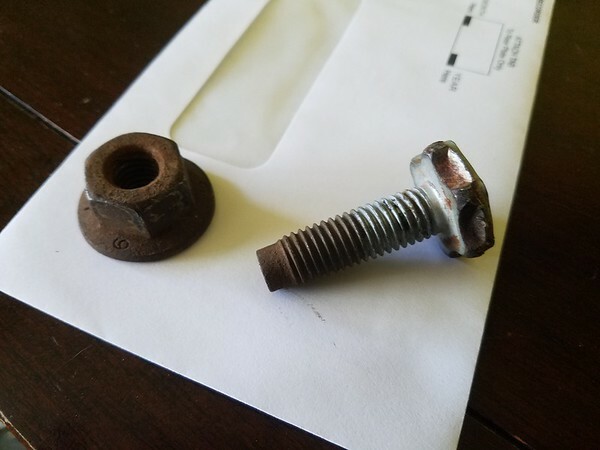 I was able to get the bolt to spin, but the nut is still seized. Is the next practical step to cut the bolts? Does anyone have familiarity with installing aluminess tire carrier and how the bolts are positioned without this plastic/rubber piece? I hope the bolts can be easily sourced through Ford dealer. What started as a simple annoying rattle on the carrier has become a headache. I had decided I wanted to replace all the hardware as other Pieces on the carrier were slightly rusted. Aluminess hasn't been the most helpful and sent wrong replcement parts for the rest of the carrier already. Some pics would be really helpful. Location in your profile would also be helpful. The Aluminess Spare Tire swing arms for stock OEM bumpers, mounts sandwiched between the stock bumper flange and the frame horn, technically, it does not mount to the bumper at all. There is a spacer that mounts the same way on the passenger side to make the bumper equal on both sides. I do not recall anything special about the bolts and nuts used to mount the stock bumper to the frame. I do not know what you mean by plastic caps?? If the black plastic part is what I am thinking it is, then I have been there and done that, when I was installing my tire carrier on a non-step stock bumper. There are 2 bolts that are connected together with a piece of black plastic, this keeps them spaced appropriately to go into the frame horns so that a nut can be placed on them. It's hard to describe but the black plastic is inside the bumper part, but can't be removed since the bumper is not deep enough. My nuts were a bit rusty( ) and because the bolt head is encased in the plastic there is nothing to grip onto on that side, no amount of PB Blaster was going to help. Ultimately I gripped the nut with an adjustable wrench and twisted until the plastic broke apart, then I was able to get a pair of Vise Grips onto the broken plastic side and unscrew everything. 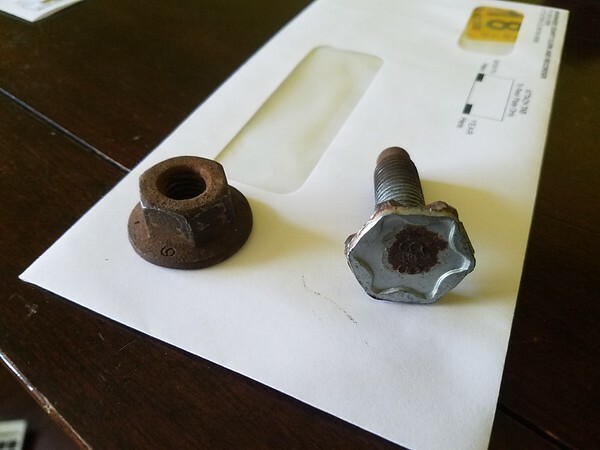 Once it was all apart I just went to the hardware store and bought the highest grade hardware I could and used an actual nut, bolt, and lock washer. It has held tight for a year now. Here is a pic of the stock bolt and nut. As you can see the top of the bolt doesn't even have a normal hex head on it, since this part was inside the black plastic. They other weird thing is that even if you get the nuts off, on a non step bumper you can't remove the two bolts and black plastic holding them together because there isn't enough clearance. So if you want to replace with an actual nut and bolt you have to break everything apart no matter what. Perfect. I was envisioning a bolt similar to what you pictured. It's hard to get a picture of the cap over the bolt head, but since it's now broken free as you described, I'll get some vise grips on the exposed portion. Here are pics of the two bolts I'm referring to. Aha. Those bolts are supposed to be connected to a plate that holds both of them.. so you don't need a wrench on the backside. But if they've rusted and broken free from the plate, well, either vice grips or cut them. Ah, that hard plastic plate that is formed with the bolt heads in the plastic. I had one crack on a front bumper. Once I got it off I fixed it with a really strong two part epoxy.